Smartphones are ubiquitous, and smart salespeople know how to use them and other technology to their advantage. Businesses know they need to optimize for mobile, create mobile apps for consumers, use responsive website design, and stay abreast of new technology for their customers. Salespeople also need to use this technology for themselves. There are hundreds of apps that can help salespeople stay organized, learn something new, connect with other salespeople, gain insights into data, and more. Not only do salespeople need to learn how to use these apps, but they also have to figure out which apps are best for their needs, as well as which apps work well together. Fortunately, we did the work for you. To make sure you’re reaching your goals, consider the following apps and other technology you can use to make your job easier. This technology allows you to accept payments on the go. It’s a small device that connects to your smartphone; your customers can swipe their credit cards for a flat rate of 2.7 per cent. The payment is processed instantly and you typically see the deposits in your account the next day. The company sends companies the free card reader. Once a credit card is swiped, the mobile screen prompts the customer to leave a tip (or no tip) and then “sign” the screen. There is also an option to have a receipt emailed to the customer, which may be a great way to earn email addresses (just use them wisely). Although this technology does require the salesperson and the customer to be face to face, it’s a great way to eliminate excessive invoicing, get paid quickly, and help salespeople who are at events or going door to door. And when clients come to the office for meetings, this technology gives you the power and convenience to process payments on the go. As salespeople know, keeping track of your clients, networking, and making connections is an important part of the job. It can be exhausting, and most salespeople have a pile of business cards to keep track of, follow-up with, and essentially memorize (especially if you attend an event). CamCard helps you keep track of these cards and stay organized. This app makes it easy to convert business cards into contacts in your phone: Take a picture of the business card, and then upload the picture to the app. Once you upload the photo, the contact will be listed in your phone; you’ll also have a CamCard library where you can see all of these contacts. The app gives you the option to connect with that contact on LinkedIn, which makes your “after event” duties much easier. The app costs $.99. Another app called Scan Biz Cards offers the same features and is available for iPhone and Android. If you’re interested in this type of service, do your research to see which design is more to your liking. This is a great app you can download to help give you insight into how much the margin would be on a business idea. You can calculate sell price, cost price, gross profit margin, markup, and break-even analysis. 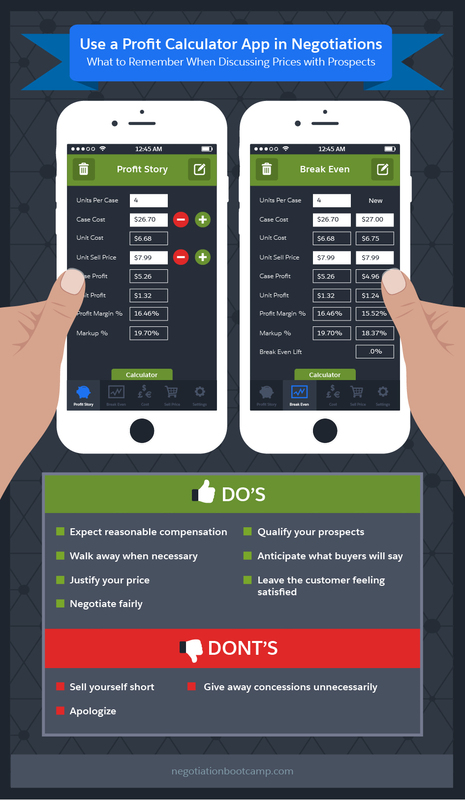 For salespeople, this makes pricing products easier: If a potential customer wants to negotiate the sale, this type of calculator can help give you an idea of how much you can bend. The app costs $1.99. This app is great for organization and making sure you meet deadlines. It’s available for both iPhone and Android and it helps keep your to-do list in order. You can create different folders for tasks or for things you want to remember, and even collaborate with others by sharing folders through the app. When you complete a project, just swipe to cross it off, and then delete. The app has helpful features such as voice transcription, which is great for salespeople who are always on the go. It can sync with a Chrome extension so that all of your to-do list items can be transferred to your Gmail account. It reminds you what you need to get done each day so you can make sure you stay on track. For busy salespeople, especially those who travel, Any.do will help you keep organized. Every good salesperson has a pitch ready to go at all times—it’s crucial to success. Keynote makes your presentation portable and can help make sure you stay on track if an opportunity arises and you weren’t necessarily prepared. This app from Apple allows you to not only bring presentations with you, but also gives you the option of creating interactive presentations on the go. You can view, edit, and share—all from the app. This app is probably best used on a tablet, especially when you need to present information to a client or a small group of people. However, you do have the option of plugging your device into a projector. The app costs $9.99. Fileboard helps salespeople qualify their prospects by calculating which contacts are ready to buy and who are just looking. It does this by showing you when your emails were opened, which slides of a presentation someone viewed, how much time they spent looking at a slide, and more. Fileboard won the Salesforce Rising Star Award in 2014. It gives you more control and knowledge about your leads, and lets you know when you should pursue a sale and which leads are still at the top of the funnel. This app has a free 14-day trial, and users who sign up pay different rates depending on their business needs. Salespeople often find themselves in a place with no scanner, yet they need to get information back to their desks quickly or to a coworker in a hurry. Whether it’s a large document, a business card, or a pamphlet someone gave you at an event, Doc Scan scans copies and then uploads them to Google Docs or Dropbox (two more apps you should consider downloading). The best part: It’s free. This app offers unlimited conference calls (for nearly 100 people, if necessary), up to six hours each, for people in the U.S., Canada, Australia, and much of Europe. It’s a web-based interface, so you can use the app without paying for a dedicated service. You can also record calls, so you’re not missing out on any features by using this app. This is a great app for a sales team with a limited budget or one at a small- or medium-sized business. Because conference calls can be crucial, the FreeConferenceCall.com app can help ensure making conference calls is easy and professional. Several experts consider Salesforce one of the top mobile customer relationship management (CRM) apps for salespeople. It allows you to run everything from one place. This includes dialing into meetings, checking your CRM records, logging calls, analyzing conversations, working with social media, and monitoring trends. 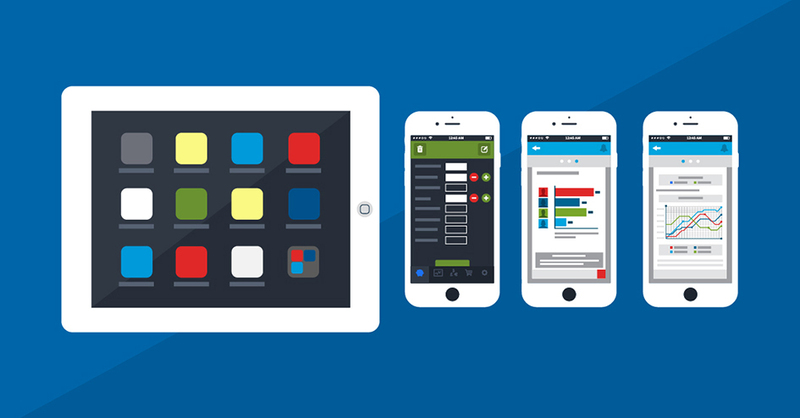 The Salesforce app is customizable, so you can have a unique experience and make sure you have everything you need. 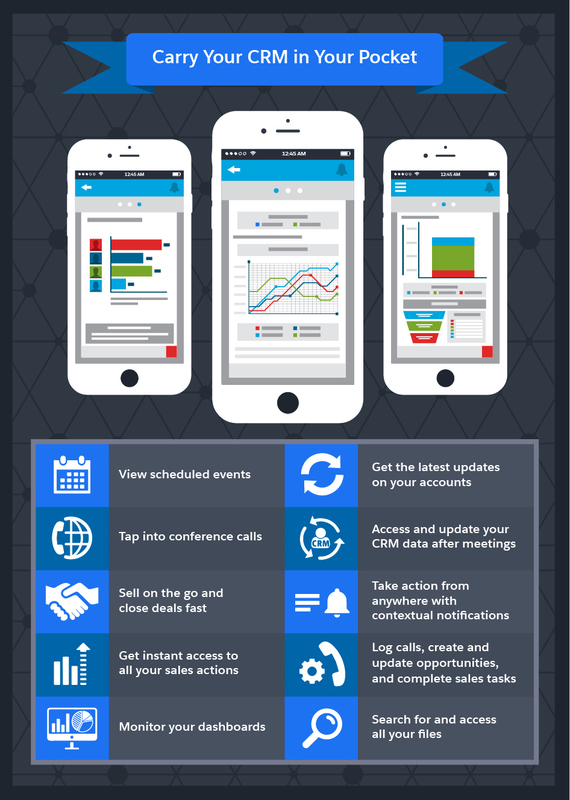 Many salespeople download this CRM app first, then decide which other apps will best suit their needs. It’s worth mentioning that a salesperson should use some of the most basic apps, including email, Chrome, Google Docs, and social networks such as LinkedIn, Facebook, and Twitter. 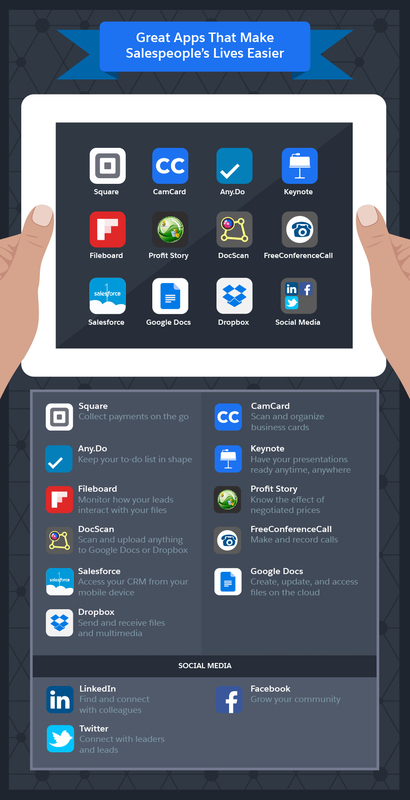 These apps are essential to success in sales, and although they may not make the list of the hippest or trendiest apps, they should already be in your app library. It’s important to find the right balance and get into a rhythm when it comes to using apps and technology. Start by creating a set of goals and challenges, and then add apps to your collection and your schedule. Chances are you’ll need to use more than one, but getting started with too many apps at once can be overwhelming. Start slowly, and eventually these technologies and apps will become a necessary part of your workflow.